Compaction of structural soil at station 35+58LT to 36+11LT. 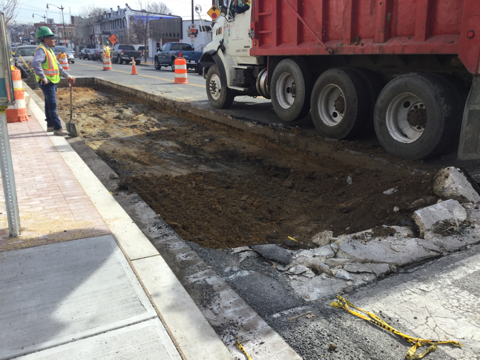 The Contractor (Capitol Paving of DC) continued to work along the eastbound side of Kennedy Street NW and the started work on the westbound and eastbound sides between the intersections of Illinois Ave NW and Kennedy Street NW to N. Capitol Street NW. 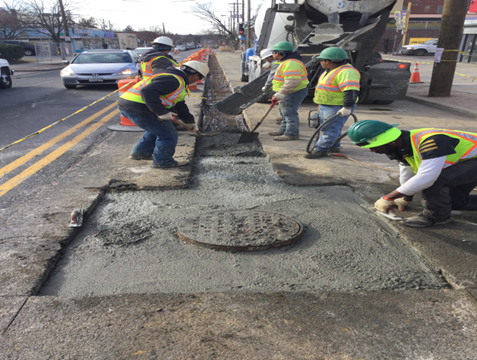 The contractor furnished and installed one (1) double catch basin at 8th street intersection and furnished and installed 502 feet 8” X 12” granite straight curb, 86 feet 8X12 circular granite curb and 746 square feet of Brick Gutter. 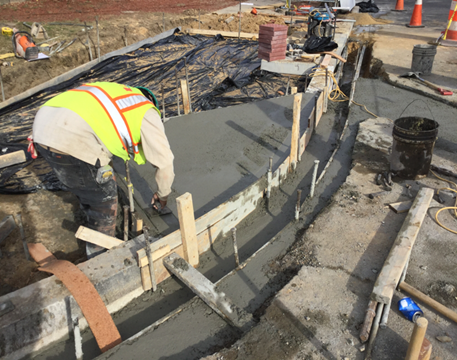 The contractor laid about 416 square feet of brick sidewalk on PCC base, poured 160 cubic yard of concrete for the sidewalks and about 33 cubic yard of PCC driveway alley entrance. The contractor also installed one (1) wheelchair ramp. In addition the contractor supplied about 78 cubic yards of sandy base structural soil. 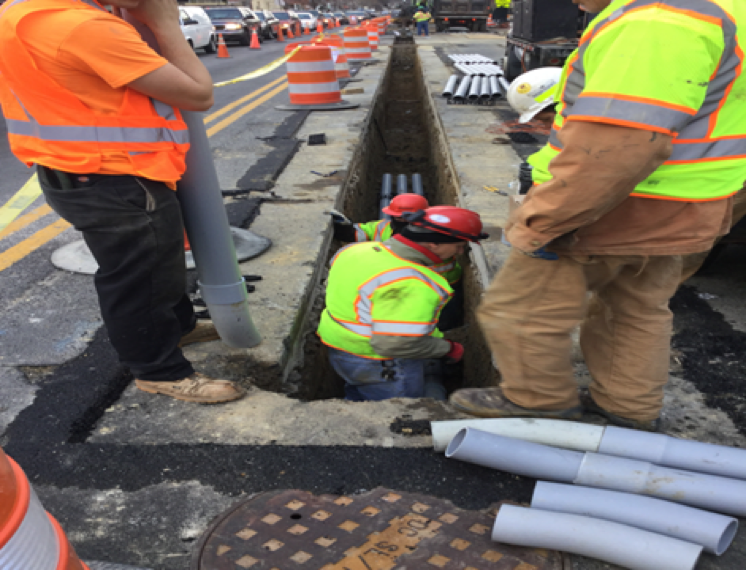 The sub-contractor Jaxson Point performed the electrical work by installing 113 feet of 6-4” 40 rigid conduits, 113 feet of 1-2” 40 rigid conduits and 103 feet of 6-4” and 1-2” 40 rigid conduits. 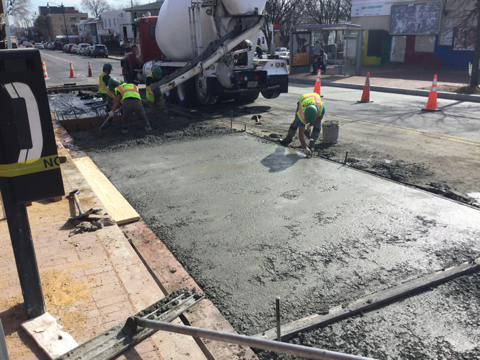 PCC sidewalk poured and finished at stations 34+30LT to 34+52LT. 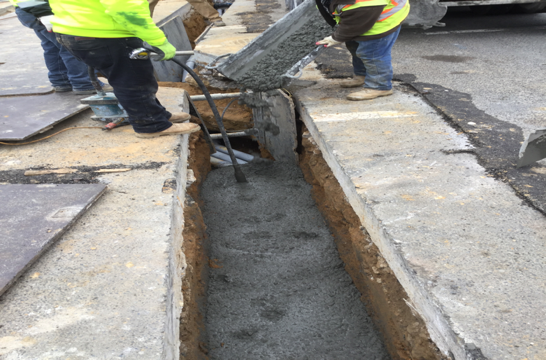 The Contractor (Capitol Paving of DC) continued to work along the eastbound side of Kennedy Street NW and the started work on the westbound and eastbound sides between the intersections of Illinois Ave NW and Kennedy Street NW to N. Capitol Street NW. 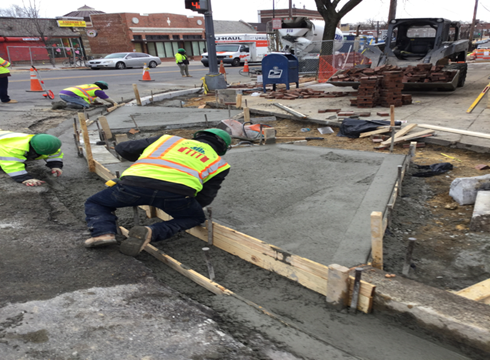 The contractor furnished and installed one (1) triple catch basin and furnished and installed 222 feet 8” X 12” granite straight curb, 28 feet 8X12 circular granite curb and 348 square feet of Brick Gutter. 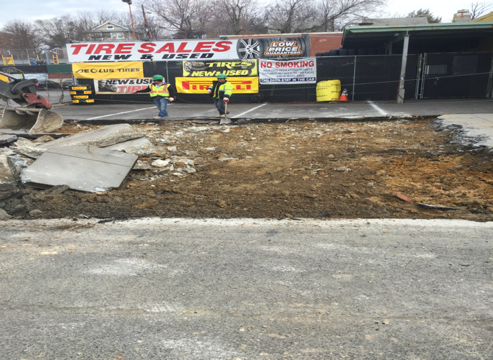 The contractor laid about 393 square feet of brick sidewalk on PCC base, poured 325 cubic yard of concrete for the sidewalks and about 6.0 cubic yard of PCC driveway alley entrance. The contractor also installed four (4) wheelchair ramps. 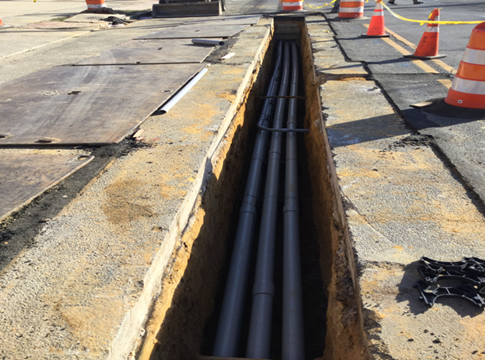 The contractor Jaxson Point performed the electrical work by installing 189 feet of 6-4” 40 rigid conduits and 165 feet of 6-4” and 1-2” 40 rigid conduits. In addition, they installed one (1) 3’x3’x3’ electrical manhole. Finishing of PCC bicycle ramp at station 46+34LT. Installation of brick gutter from station 31+25LT to 31+80LT. 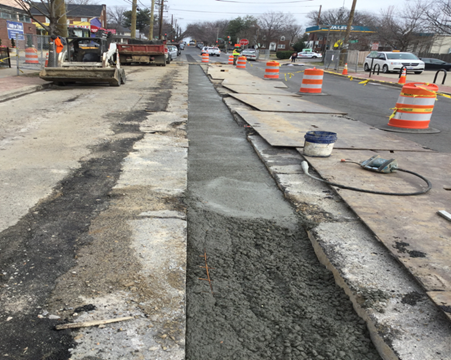 The Contractor (Capitol Paving of DC) continued to work along the eastbound side of Kennedy Street NW and the started work on the westbound and eastbound sides between the intersections of Illinois Ave NW and Kennedy Street NW to N. Capitol Street NW. 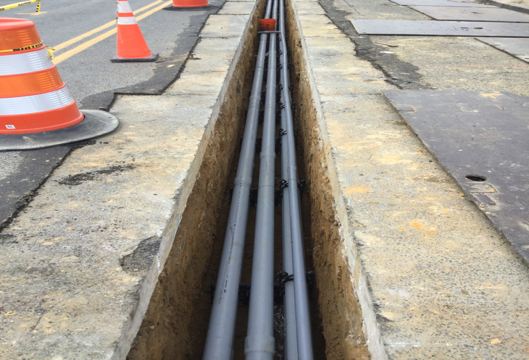 The contractor furnished and installed one (1) double catch basin, and about 20 feet connecting drain pipes. 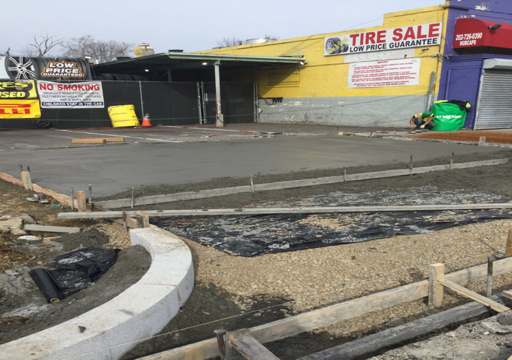 Also, Capitol Paving furnished and installed 725 feet 8” X 12” granite straight curb, 88 feet 8X12 circular granite curb and 1009 square feet of Brick Gutter. The contractor laid about 248 square feet of brick sidewalk on PCC base, poured 63 cubic yard of concrete for the sidewalks and about 28 cubic yard of PCC driveway alley entrance. The contractor also installed four (2) wheelchair ramps. 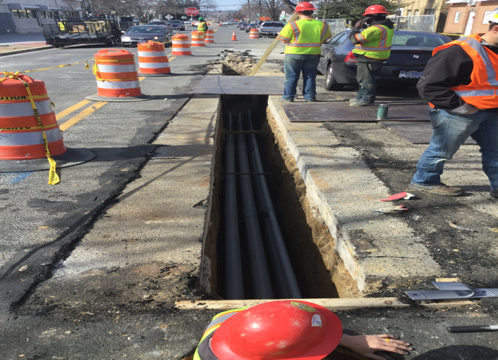 The contractor started the electrical work by installing 196 feet of 6-4” 40 rigid conduits. 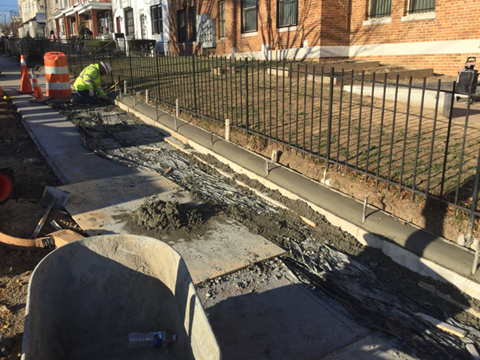 Capitol paving also installed a new fire hydrant and 6” valve near 5th street NW intersection and installed 7 tree protections.